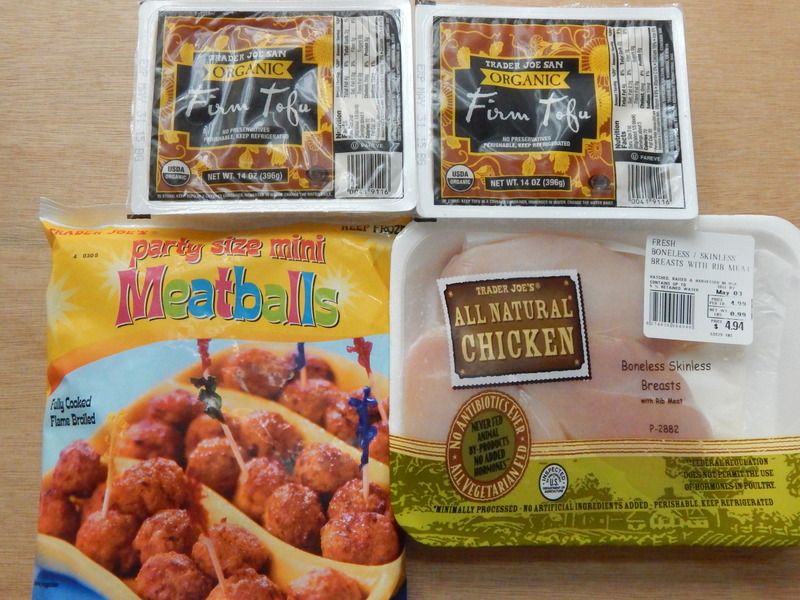 Protein: I picked up my firm tofu which I buy every time, frozen mini meatballs for Tommy and some chicken breast. I used the chicken breast for homemade chicken caesar salads, yum! The mini meatballs are for adding into pasta for my husband or putting them on top of rice for his lunch. I don’t eat beef, so those are easy for me to add to his meals. Seafood: I finally decided to try the mahi mahi burgers, and they are awesome! I also got their low sodium albacore tuna. We made the burgers for dinner this week and they were so good! I will post a photo on my instagram soon so if you follow me there you can look for that. Trader Joe’s tuna is now my favorite. It is really high quality, and I like the lower sodium option. They also have salt free if you are looking for that. 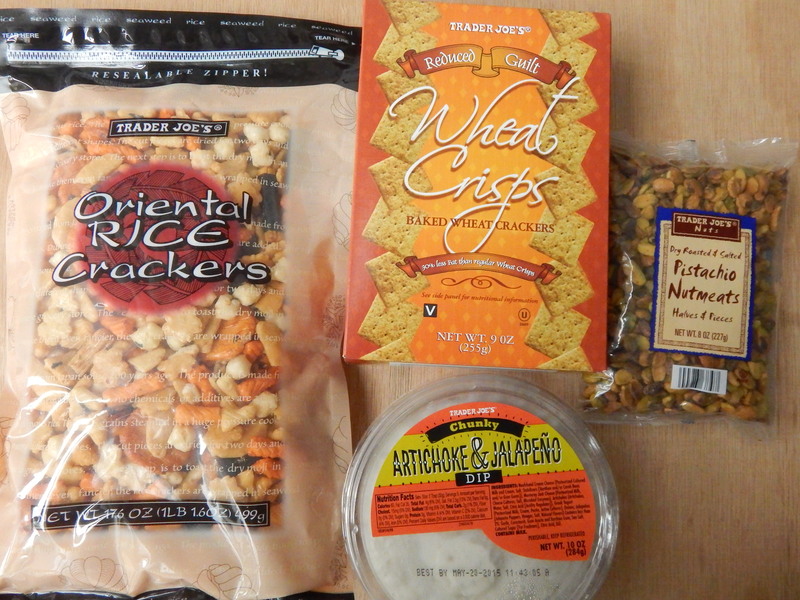 Snacks: Oreintal rice crackers are one of Tommy’s favorites, so I bought him a giant bag lol. 🙂 pistachios, artichoke & jalapeno dip and wheat crips crackers. Why do pistachios have to be so expensive!??!! If I could insert the crying emoji right now I would, but I bought them anyway. The artichoke jalapeno dip is new, and it’s really tasty with the crackers. I took it to my cousin’s house and we all enjoyed it together. 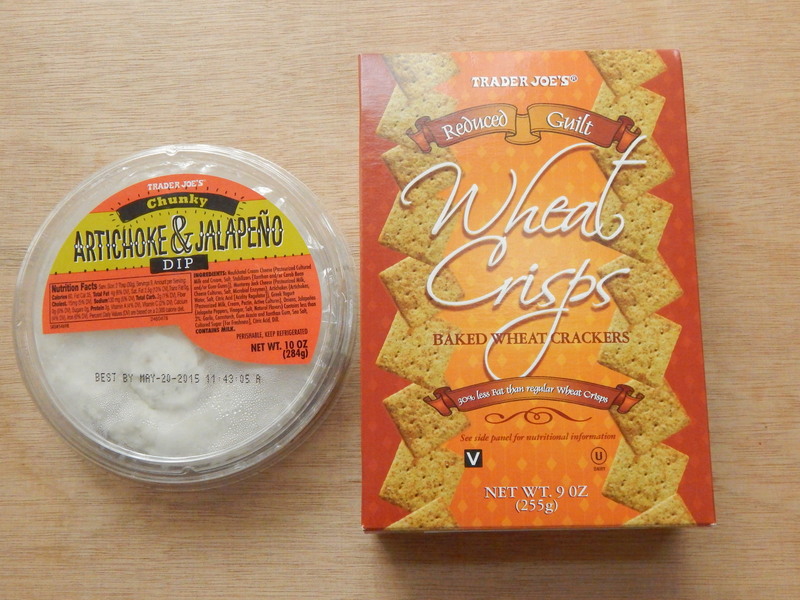 The crakers are a Trader Joe’s version of wheat thins, and I like them. 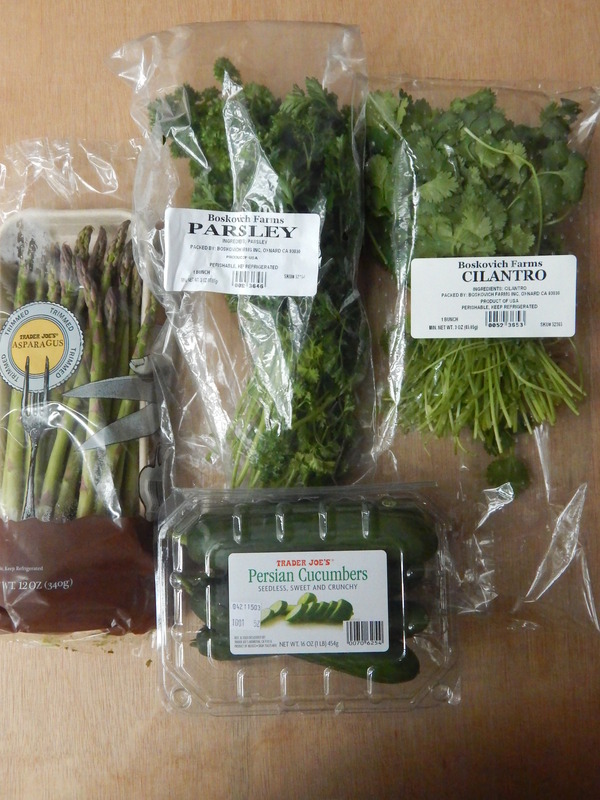 Fruits & Veggies: Asparagus, parsley, cilantro, and Persian cucumbers. These are just the best cucumbers ever. Tommy ate them all… I didn’t even get one! Crying emoji face again. 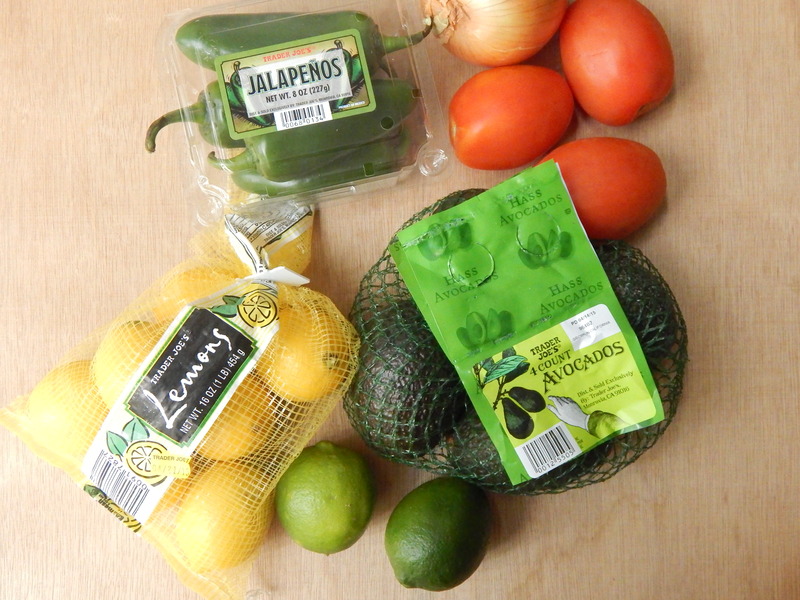 I also got jalapenos, an onion, tomatoes, avocado, lemons and lime. All good stuff! 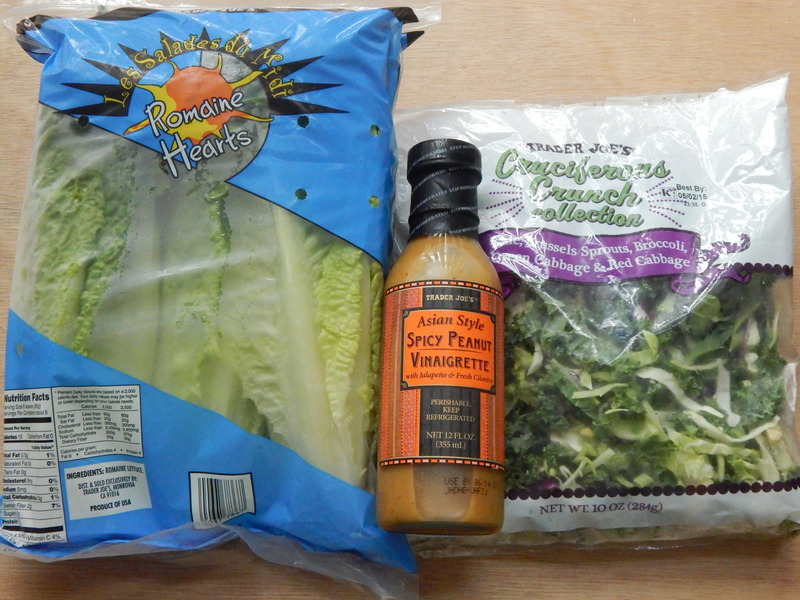 Salad: Good ol’ romaine lettuce, cruciferous crunch collection salad mix, and spicy peanut vinaigrette. This dressing is delish. It has a smokey flavor that I really enjoyed. You can find it in the refrigerated section near the salad. I put it on the the cruciferous crunch salad, and it paired really well together. The crunch salad mix is so good for you. It has: kale, shaved brussel sprouts, shaved broccoli, green and red cabbage, and it’s super cheap at $1.99. 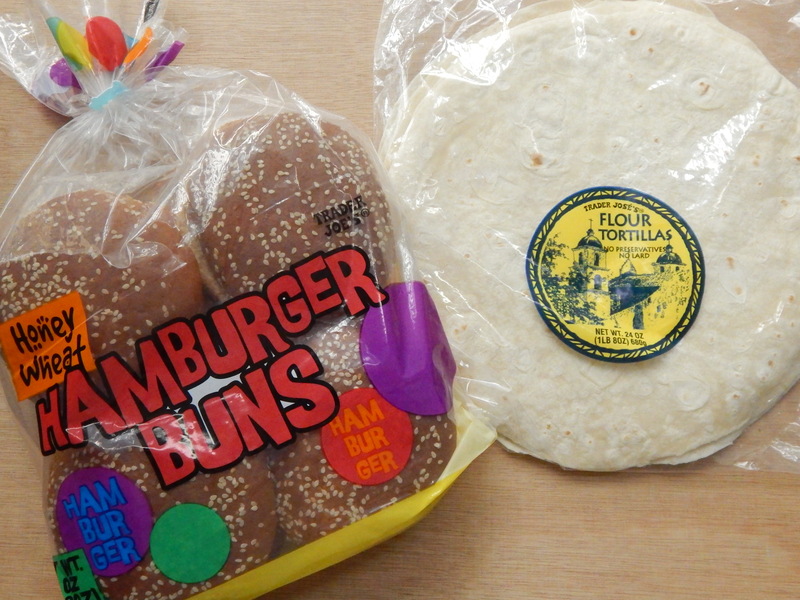 Breads: I got wheat buns to go with our mahi mahi burgers and flour tortillas. They buns were really good toasted with the burgers. I will use the leftover ones for some veggie burgers I have as well as for tuna salad sandwiches. The tortillas have a super thin texture and they break apart easily. We didn’t love them, and I wouldn’t buy them again. 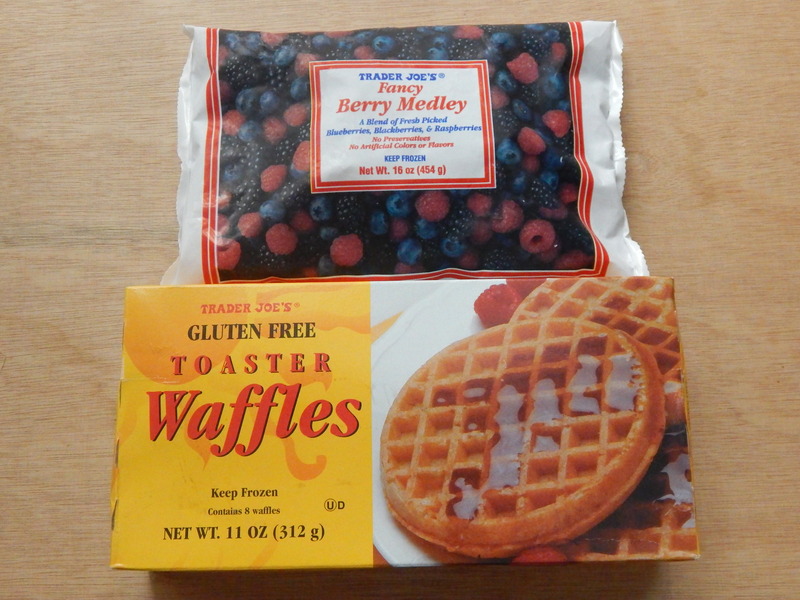 Breakfast for her: Frozen fancy berry medley and frozen gluten free toaster waffles. For my breakfast I love making protein smoothies or waffles. This week I topped my waffles with almond butter and some strawberry jam, and omg it was good! 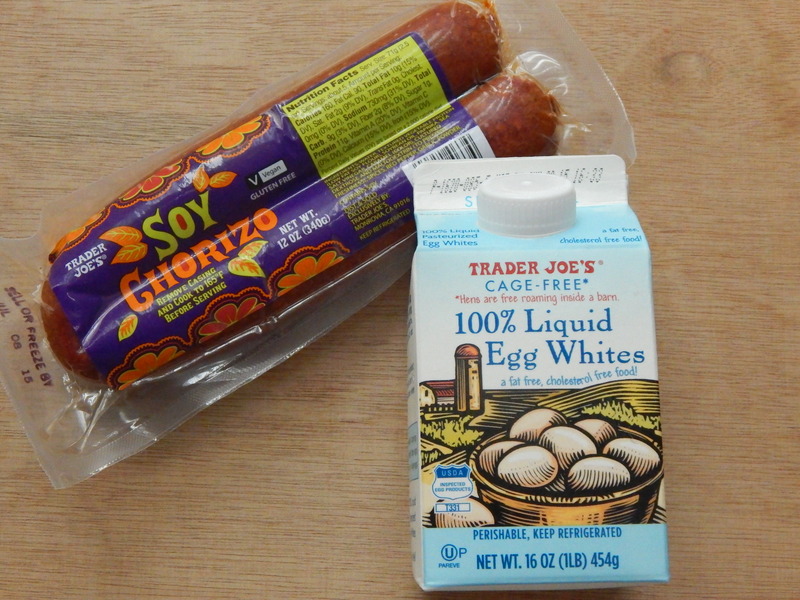 Breakfast for him: I tried 2 new items for my husband’s breakfast: soy chorizo and liquid egg whites. We have tried another brand of soy chorizo before but never the TJ brand. I don’t like eggs, so I didn’t eat this, but my husband loved it, and said it tasted great like regular eggs and regular chorizo. I made huevos con chorizo burritos with avocado a couple of times with these ingredients. You can see that photo on my instagram too. 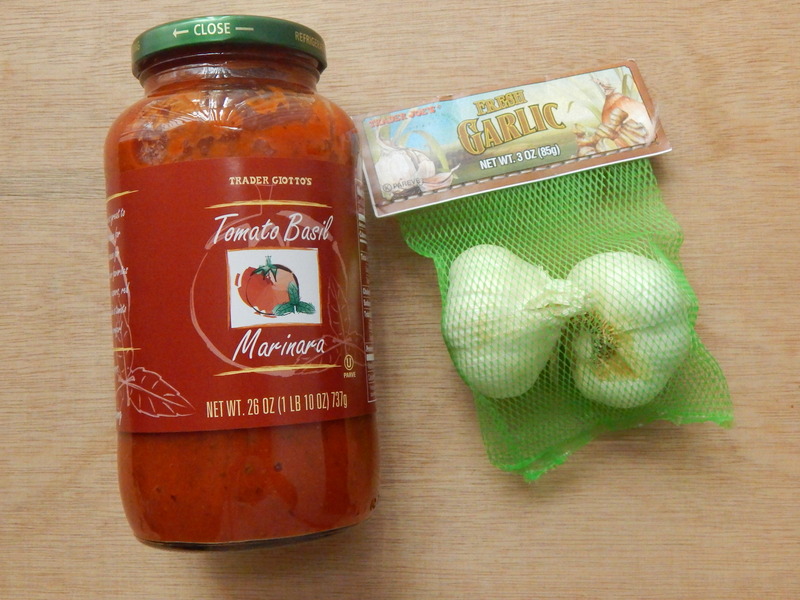 Pantry: Marinara and garlic. Just 2 simple ingredients. Lol! It’s so fun! 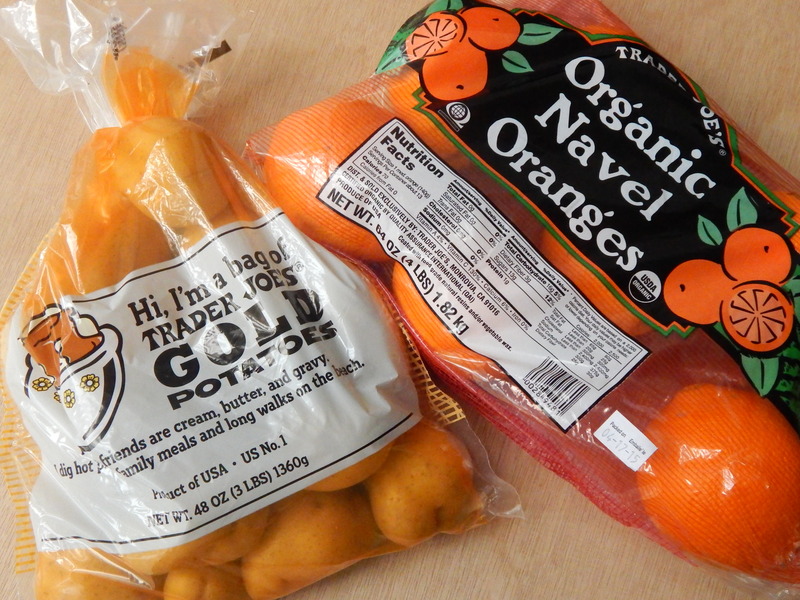 Haha 🙂 I love yoyr grocery hauls, so excited that you got to check out mine!